Australia’s Prime Minister Tony Abbott has resorted to YouTube to ramp up pressure on the opposition Labor Party for repealing the controversial carbon tax scheme. A bill to repeal the scheme is set for debate in the Senate, where the opposition is in majority. 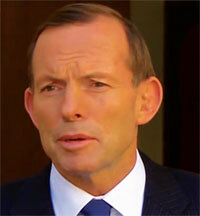 In the video statement, Abbott repeats his government’s assertion to abolish the carbon tax. The scheme, introduced under the previous Labor government, levies a tax on polluting power companies. Abbott says the tax cost jobs and forced energy prices up. The bill to repeal the scheme would save families hundreds of dollars and would be the “best possible Christmas present” for Australians, Abbott says. Labor Party, which says the government is a climate change denier, insists that it will vote for the bill only if the carbon tax is replaced with emissions trading scheme, and not the proposed Direct Action policy, which gives taxpayers’ funds to polluting companies to cut their emissions.